Black Friday is an exciting and terrifying day. Will you get a deal on a TV or will you get elbowed in the face while fighting over a pressure cooker? Who knows? That's the fun, or something? 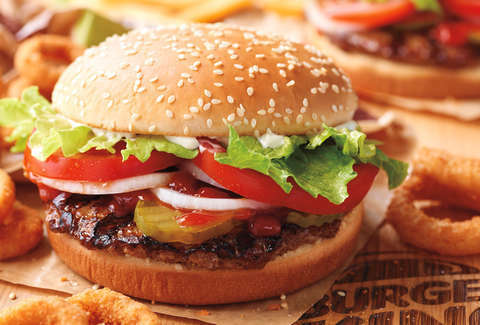 With all that pressure on you, you might as well do something nice for yourself, like get a free burger while you shop. Thankfully, Burger King is giving out free Whoppers in celebration of the chaotic shopping frenzy of Black Friday. The way you'll get them is a little convoluted, so bear with us. In short, Burger King has created a website called WHOPPER-SHOPPER.com. This website consists entirely of banner ads for other brands. When you click through those ads and buy things, a percentage of that sale will go to Burger King, and Burger King will pay out that cut to you in the form of a free Whopper voucher. Basically, Burger King built an online store and if you buy items from the featured retailers, you'll get rewarded with free burgers. The website will be live as of noon on Thursday, November 15 and will be up through Cyber Monday, November 26. You'll only be able to earn three free Whopper vouchers per person, and vouchers will only be available while supplies last. Once the promotion is over, the vouchers will be sent your way, and you'll be able to relax and eat a large burger as you reflect on the pleasures and horrors of consumerism. If you do most of your holiday shopping through this website, you should be able to get yourself three free sandwiches -- certainly preferable to the expensive knuckle sandwiches procured in Black Friday fights.